THIS CODE IS NOT BEING DEVELOPED NOR MANTAINED ANYMORE. Casainho was developing and mantaining this code up to June 2018 but stopped because he started using on his ebikes the alternative TSDZ2 mide drive motor that uses another motor controller. Not having the hardware, it would be impossible to keep developing and testing the firmware. 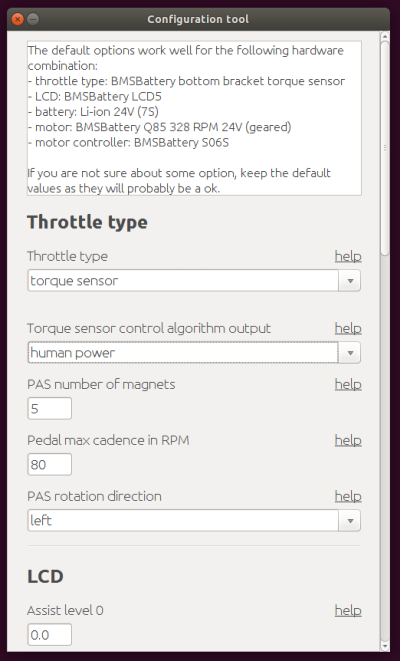 This OpenSource firmware/embedded software runs on the BMSBattery S/Kunteng KT EBike motor controllers. ◇ Stancecoke is maintaining an alternative fork of the code with some specific features that you may prefer -- please read here. See some videos on youtube by searching on youtube for “OpenSource firmware Ebike BMSBattery”. 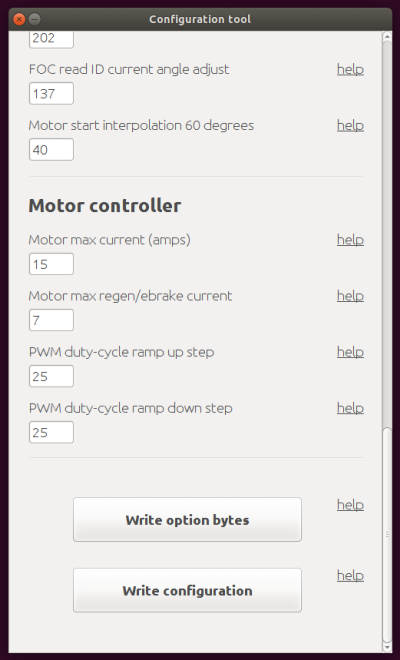 Casainho started this project on 25 April 2017 because he wanted to develop an OpenSource firmware for EBike motor controllers. Why did he want that? because he wanted to use a well know controller that it was easy to repair/mod/adapt for his specific projects. He started to develop the firmware as OpenSource and he would like to share with others that had the same needs. His mission is similar to the Tesla mission (https://www.tesla.com/blog/mission-tesla): "to accelerate the advent of sustainable transport" and innovation on personal light electric vehicles. The idea was to found a cheap and widely available EBike controller that could be programmable. He was developing, since 2015, firmware for the controllers of electric unicyles and they use the microcontroller STM32F103, that is very cheap and popular - the board is also cheap and widely available on market, that comes from China. By the way, the hoverboards controllers use the same STM32F103 microcontroller. For EBikes, he found the most recent BMSBattery S series controllers like S06S sinewave use the STM8S105C6T6 microcontroller that is programmable, easy and cheap to develop for. There are OpenSource and cheap development tools for it. BMSBattery sells the S series controllers, starting with S06S of 24/36V 15A (0.5kW, 6 mosfets) up to S12S of 72V 40A (2.9kW, 12 mosfets). This controllers are developed by Kuteng (http://www.szktdz.com/en/ | http://minshine.cn/). There are available on the market in many different versions of Kuteng controllers, from 24V, 36V, 48V and 72V, with max currents of 70A (5kW, 18 mosfets). Over the time, more and more users/developers did join the project and it was not anymore his project but a community project as he wished since the begin! You can find their nicknames and contributions on the forum message or git commits. This documentation was written entirely using CherryTree software (OpenSource and available for Linux, Windows and MAC) and was exported to HTML.